Jim’s wife of 43 years and high school sweetheart, Janet Naugle, met as sophomores at Galesburg Sr. High School in 1966 where both were involved in athletics, Janet as a cheerleader. They would eventually marry in 1971 and begin to raise a family with the birth of their son Aaron, prior to the start of Jim’s baseball career. 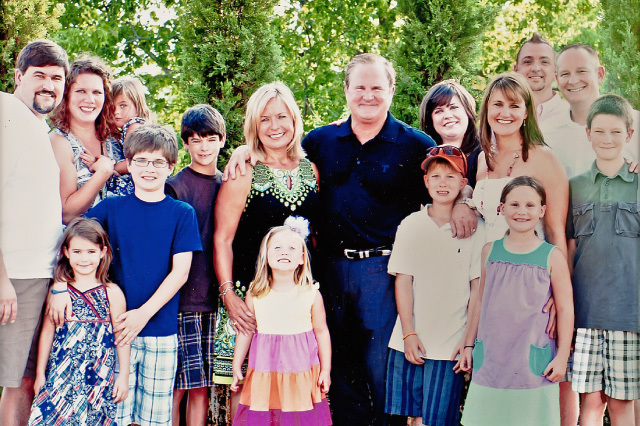 Janet and Jim along with Aaron moved to Arlington, Texas in 1974 to begin play with the Rangers and raise a family. They would eventually add two more girls, Audra and Briana, to the family and all would be raised in Arlington. Family would be a central theme for the Sundberg’s, working in travel plans around road trips during the baseball season. Jim would often take his children individually on roads trips to give them the experience of travel and alone time with dad in his workplace. At this time in major league culture, kids on road trips would be cutting edge stuff and often not favorable to many. Eventually, other dads began to mirror the road trip experience for their kids. Looking back, this would turn out to be one of the healthiest actions taken for the development of their children’s character. Janet tries a hit during a family game in the 70’s while Jim messes with her. Janet was determined to compete on the big field by trying to get her opponent out. Aaron enjoys a little down time on top of Rangers new spring training dugout in Pompano Beach, Florida in late 70’s. When Jim began to be traded to other teams with the first stop being Milwaukee in 1984, the Sundberg’s decided to purchase property in those other cities in order to keep the family settled in a home environment. Kids were going to private school so home schooling became an option for the April & May months. That pattern continued the following year in 1985 when Jim was moved to the Kansas City Team. “I have concluded that all the accumulation of wealth, even if I could achieve it, is an insufficient reason for living. When I reach the end of my days, I must be able to look backward on more than just Gold Gloves, All-Star Games, World Championships and records. Nor is fame of any lasting benefit. I will consider my early existence to have been wasted, unless I recall a loving family, a consistent investment in the lives of people and an earnest attempt to serve, the one and only God, who made me! And nothing else makes much sense”. This is has been Jim’s life mission for thirty years and at times the right challenge for the right moment. A mission statement used to help refocus during times of difficulty. Janet was the consistent thread that brought stability during a baseball schedule, a period classified each year by the Sundberg’s as an overwhelming season of time. A Major League Baseball schedule was a tremendous grind and very little time for outside things. So Janet and Jim decided early that other things would be family time. Janet was the person who influenced everyone in the family, including Jim, with the value of independent thinking on all sorts of topics. It was Janet that pushed to establish a Sundberg children’s educational fund so that all their kids would have the opportunity to get a college education without being strapped by debt. All three children would eventually receive their BS degree from Auburn University. Janet herself would receive her Master’s Degree, with honors, in organizational development from the University of Texas at Arlington. Aaron went on for more education to get his Master of Nurse Anastasia and currently works at a major Children’s Hospital. Audra and Janet currently own a franchise for a Children’s Consignment Event Company. Briana, recently married, is an executive director for Miracle League DFW a baseball league that serves kids with special needs. Tragedy would strike the family in 1981 with the death of what would have been their third child and second daughter. The baby was delivered and died in delivery during Janets’s last month of pregnancy. It was a very dark day as she spent the day alone while Jim worked his way back from a west coast road trip. Two years later in 1983, they would introduce their third child and second daughter Briana into the world. All of the Sundberg children were involved competitively in sports throughout their childhood attending one of the top high schools in Texas. The daughters were very much engaged in select sports playing volleyball during their junior high and high school years. The Auburn connection would come through older brother Aaron, who received a baseball scholarship at Auburn. Audra playing one year of volleyball for the Tigers of Auburn and retired. Briana would follow siblings to Auburn but decline to play sports at the college level. It was through their children’s sports experiences and the Sundberg’s knowledge and experiences in Major League Baseball that initiated a publisher in 1999 to approach them about writing a book on sports parenting. Janet and Jim had determined early in their children’s lives that sports would focus on fun and proper fundamentals as the foundation to the sports experience. Their book, How to Win at Sports Parenting, is about helping parents navigate, what has become, a very competitive sports experience in America. Today, that sports experience has transitioned into watching their eight grandchildren. Recently, Jim was asked by daughter Audra, how many games have you viewed? Upon reflection, a total of more than 5000 games have been either, played, watched or broadcasted across different professional and amateur sports venues. The Sundberg’s continue to keep family alive into the next generation. Janet, Audra and Aaron enjoy watching dad in early 80’s at Arlington Stadium. Jim attempts to help Briana at family day with the Cubs in 1987 in Wrigley Field. Our wonderful, loving family at our surprise 40th wedding anniversary.